The US Department of Defense said that Northrop Grumman will upgrade and install Battlefield Airborne Communications Nodes on the US Air Force jet-propelled EQ-4B Global Hawk autonomous airborne system for $40 million. 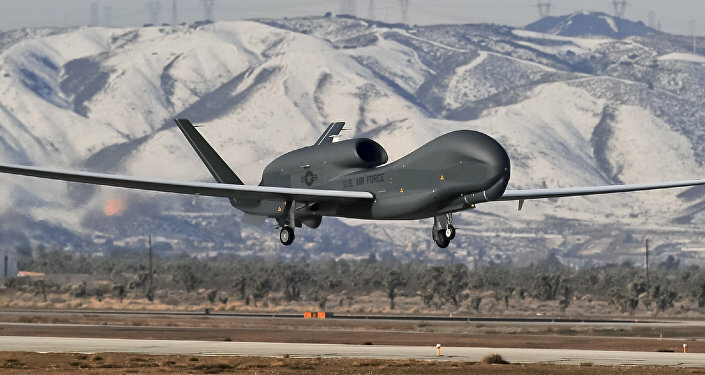 WASHINGTON (Sputnik) — Northrop Grumman will upgrade and install Battlefield Airborne Communications Nodes on the US Air Force jet-propelled EQ-4B Global Hawk autonomous airborne system for $40 million, the US Department of Defense said in a press release. "Northrop Grumman has been awarded a $39,947,203 letter contract for Battle Field Airborne Communications Node (BACN) for EQ-4B Global Hawk," the release stated on Wednesday. "Contractor will provide BACN payload modification, integration and installation onto the EQ-4B. BACN is a high-altitude, airborne communications and information gateway system that functions 24 hours a day, seven days a week, according to published Northrop Grumman documentation. The EQ-4B Global Hawk is produced by Northrop Grumman for the US Air Force.